Note regarding this Retro Hugo sub-series of Scide Splitters: The November, December and January Scide Splitters blogs will be devoted to examining humorous stories eligible for the 1941 Retro Hugo Awards being presented in Kansas City at MidAmeriCon II next August. November will cover three novellas, December will look at six novelettes, and January will include twenty short stories. This will not be exhaustive coverage of all humorous SF/F fiction published in 1940 (the eligibility year for the 1941 Retro Hugos). It is limited to those works I have readily available to me without having to dip into the funds that I am saving to attend the convention. I estimate that these stories represent about forty percent of the eligible humorous works and, of course, only a small fraction of all eligible stories, humorous or otherwise. Reader input pointing out stories I have missed will be most appreciated. Click here for more Amazing Stories coverage of the 1941 Retro Hugos. One of the interesting side effects of reading concentrated doses of 1940 genre fiction is that I started dreaming in the era, retro dreaming if you will. I have been reading every eligible story that I can get my hands on, getting reacquainted with stories that I read long ago and encountering some stories for the first time. It is actually quite fun and it makes me wish there were Retro Hugos every year so I would have an excuse to force myself into this period immersive experience more often. But not everyone has the luxury of time required for this addiction. If you only have limited time for retro reading, I highly recommend Asimov and Greenberg’s The Great Science Fiction Stories Volume 2, 1940 (included in the omnibus Isaac Asimov Presents The Golden Years of Science Fiction). It contains many of the stories that are likely to make the final ballot of nominees. While it does not have any novels, novellas or Heinlein, it does have some of the best novelettes and short stories of that year. 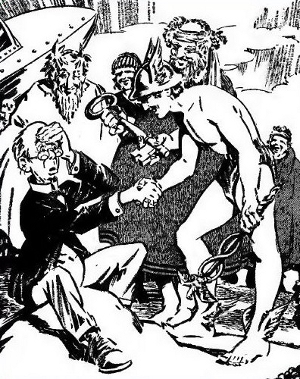 If you have more time for retro reading and don’t mind digital formats, a fan by the name of von Dimpleheimer has been producing a series of free anthologies of eligible stories that are now in the public domain. There are four volumes so far, with at least one more on the way. You can find download links for these anthologies over at File 770. Last month I mentioned that I would be reviewing seven novelettes, but I discovered that one of them is actually a novella. It also isn’t particularly humorous, so out it goes. I was able to confirm that four of the stories I am reviewing today are of novelette length (7,501 to 17,500 words). I will assume for the moment that the other two (“The Exhalted” and “Butyl and the Breather”) fit in the category. As noted last month, these reviews contain spoilers. If you wish to avoid having the plots spoiled, skip to the last three paragraphs of this blog for my general assessment and recommendation regarding novelettes (humorous and otherwise) that I consider worthy of Retro Hugo nominations. 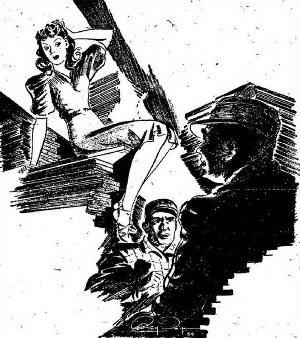 “The Strange Voyage of Hector Squinch” by David Wright O’Brien – Originally published in Fantastic Adventures, August 1940. Hector Squinch’s wife grudgingly gives him two hours to see the science exhibits at the World’s Fair. But he is warned not to report back late or there will be hell to pay. Squinch is a spineless, browbeaten pipsqueak without a friend in the world, including his wife. He takes a tour of a rocket on display at the “Transportation of the Future” exhibit and falls asleep during a lecture while daydreaming about rescuing a Martian princess. When he wakes, he not only finds that he is late, but that he is locked into the rocket. Panicked, he starts pressing buttons in hopes of getting the hatch open. The ship lifts off and eventually deposits him on Olympus, a planet occupied by Greek gods and goddesses who treat him like a hero. He realizes why they are treating him so well when he reads the headline of their newspaper, “CHAMP FROM MARS ARRIVES FOR TILT WITH ACHILLES!” After a failed attempt to explain that a mistake has been made, he resigns himself to his fate. Bacchus and Mercury take Hector out on the town so he can loosen up on the night before the big fight. He drinks too much of the nectar of the gods and boasts of how he is going to win the fight, even going so far as to taunt Achilles in public. The Gods cheer his bravery. Over the course of the evening, he becomes buddies with Bacchus and Mercury, and the two gods decide to place their bets on Hector to win. Squinch wakes up with a terrible hangover. He considers trying to tell his new friends the truth, but then realizes that they are depending on him. Having never had real friends before, he does not want to let them down, even if it means his death. During the fight, Hector is severely beaten up, but he eventually manages to bite Achilles’ heel and wins the contest. During a banquet celebrating Hector’s decision to stay on Olympus, Charon breaks the news that an investigation has revealed that not only is Mr. Squinch not from Mars, he is neither immortal nor dead, and is therefore in violation of the immigration laws. He must be sent back to Earth, but he is assured that there will be a place for him on Olympus after he dies. After falling through a whirlpool on the river Styx, he finds himself blinking in the sunlight back on Earth. Hector decides that he wants to go back to Olympus immediately and steps in front of an oncoming truck. For the most part, the story has a silly, whimsical feel. So it comes as quite a surprise when the story takes such a dark turn at end, particularly since the reader will not be all that sure that Hector’s experience was anything more than a dream or hallucination. The contrast is such a jolt that I have to categorize this as dark comedy despite most of it having a light tone. Mr. O’Brien does something similar in a short story that I will be reviewing in January. In terms of Retro Hugo consideration, I would say that the story falls a bit short. It is entertaining, and O’Brien does well to infuse humorous dialog and odd comical situations, but it is not quite up to the level of the top competition. 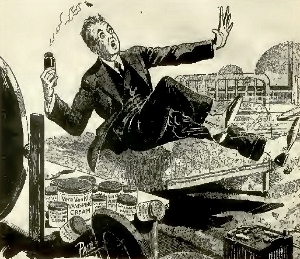 This is one of O’Brien’s earliest stories, having got his start in 1940. He went on to publish dozens more in the next couple of years. Unfortunately, he never got a chance to establish himself in the pantheon of SF greats. While serving in the US Air Force during World War II, his plane was shot down during a bombing run over Berlin in 1944. “The Hardwood Pile” by L. Sprague de Camp – Originally published in Unknown Fantasy Fiction, September 1940.
de Camp, as well as a few other places. The story starts with something of a footnote explaining that a writer, researching for his book on lore and legends, missed out on an opportunity to learn the truth about the legend of the haunted wood pile because his morality got in the way. While interviewing an attractive redhead, he comments that he is surprised that a girl of her looks is stuck working in the sticks. She rolls her eyes at him and informs him that she would like him very very much if he could find a job that had a Norway maple growing out front. The second very is too much for this moral man and he exits the story. The tale then goes back to the beginning to explain how two Norway maple trees were planted in upstate New York. One tree survives and grows big over the years as the property changes hands until the hardwood rights are purchased by a lumber company. The tree is cut down and turned into nine hundred feet of boards. These boards sit in a lumber pile until Joe, the lumberyard foreman, orders his men to consolidate some of the stacks. But every time one of the workers climbs on the pile, the wood starts to sway back and forth unnaturally. One by one, men try to work the pile but are frightened off. The foreman makes several attempts to subdue the boards but these result in even more frightful behavior, including boards moving around on their own. This proves too much for Joe and he reports it to the owner of the sawmill, Mr. Pringle. The owner suspects a plot by union organizers and goes out to the woodpile hoping to catch the agitators, but instead he finds an attractive redhead sitting on the stack. She explains that she is a type of dryad specific to Norway maples, and that her home was cut up while she was hibernating. He refuses to give her the boards and she says that she won’t allow the boards to be sold off separately because that would leave her homeless. And so follows a series of attempts by Pringle to outwit the dryad. She, however, outsmarts him at every turn. At one point he thinks he has prepared for any attack she might attempt. But she hits him where he isn’t expecting it. Pringle’s wife returns home one day to find a naked “young woman sitting at her dressing table, in her bedroom, calmly drying a head of freshly shampooed carroty red hair.” Pringle’s wife leaves him, but still he persists. Too stubborn to give in, Pringle eventually decides that he will burn her wood. He thinks he has won, but she still has another weapon up her sleeve. She threatens to do the thing that he fears the most, she will organize his workers into a union. He relents and the wood is kept together and used to make a dance floor for a local business that now employs a redhead with an odd habit of asking people where she can find a Norway maple. This story is hilarious. de Camp’s use of comic understatement is masterful, reminiscent of Mark Twain’s short comedies. “Butyl and the Breather” by Theodore Sturgeon – Originally published in Astounding Science-Fiction, October 1940. Although this story can be read as a stand-alone, it is a sequel to Sturgeon’s 1939 short, “Ether Breather,” and I do think it is more enjoyable if you read that one first. Ted Hamilton, a writer and central character in the original story, still feels guilty that about telling the Ether Breather to stop messing up color television. It has been a year since the incident and the Breather has refused to respond to any attempts to contact it. Mr. Berbelot, perfume tycoon and television hobbyist, is still mad at Hamilton for exactly that incident and refuses to speak to him. But Hamilton has come up with an idea to get the Breather to respond and Berbelot reluctantly agrees to hear him out. Knowing the Breather’s previous actions indicated a childish personality, Hamilton thinks they can get it to respond by making it angry. Berbelot agrees and demonstrates a way that he thinks might work. He has Hamilton sniff a series of increasingly subtle perfumes. Then, when the writer is in the habit of inhaling deeply, he has him unknowingly sniff a vial of concentrated skunk odor. Hamilton is thoroughly pissed off. Berbelot explains how he thinks he can transmit a television wave that will replicate an offensive smell. It works, the Breather is angry and thinks that Hamilton is the perpetrator. But the writer doesn’t realize that Berbelot has fixed his bedroom mirror up with a newly invented 3D television. The Breather, a fifth dimension creature, having learned about projecting things into fewer dimensions by watching Hamilton make shadow puppets on his wall, breaks through the television and beats up the writer. Berbelot smooths things out by explaining that it was all done in fun, fun being a major motivator of the Ether Breather, as was made clear in the original story. What can you say about a Ted Sturgeon story? Nearly everything he wrote was of exceptional quality. In “Butyl and the Breather” you get palpable characterization in a well-executed comedic premise. 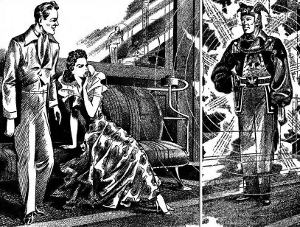 “The Exhalted” by L. Sprague de Camp – Originally published in Astounding Science-Fiction, November 1940. “The Exhalted” is the fourth and last story in de Camp’s Johnny Black series. Johnny Black is a bear that has had his intelligence elevated to human level by a treatment invented by Professor Methuen. After conducting a behavioral experiment on an undergrad, the professor heads off to teach a class, but Johnny asks if this is advisable considering that the professor has recently tested his Methuen treatment on himself. The professor says there is no cause for concern because the treatment had no effect on him. A series of pranks happen on campus, including one at a banquet for an important donor making an endowment to the college. By this point, Johnny notices a pattern. The professor is the only person present at every one of the pranks, and the bear starts to wonder if maybe the treatment had some effect after all. Johnny recruits the help of a reporter and during the next prank, an illusion that one of the campus buildings is on fire, Johnny see the professor with a projector. The bear knocks over the projector causing the fire to vanish. 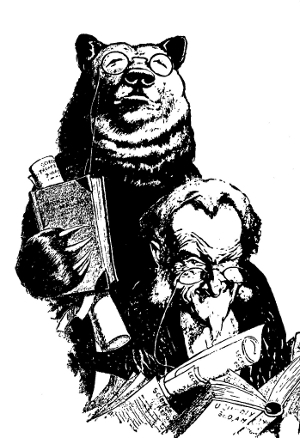 The professor flees with Johnny in pursuit, but when the bear approaches the professor’s residence, he finds that the ground has become frictionless. Police and students arrive on the scene, slipping and sliding all over the place. Johnny figures out how to approach the building using suction cups and succeeds in capturing the professor. Due to the professor’s behavior, the donor has withdrawn his endowment offer and is getting ready to leave town. Johnny thinks he may have an antidote to the treatment – alcohol. The reporter sneaks a flask to the professor who returns to normal by getting drunk. He tells Johnny how he can save the endowment by using one of the devices he invented while he was a crazed genius. The bear and the reporter successfully execute the plan and all is well, so long as the professor drinks enough alcohol. “The Exhalted” is another superb comedy by de Camp. What I find interesting when comparing this story to “The Hardwood Pile” is that he employs two different humor techniques, and he does them both very well. “The Scientific Pioneer Returns” by Nelson S. Bond – Originally published in Amazing Stories, November 1940. This story brings together two separate series by Bond, Lancelot Biggs and Horse-Sense Hank. Biggs is a far future spaceman whose tinkering regularly get him into and out of trouble. Hank is a down-to-earth, uneducated, turnip farmer whose common sense somehow penetrates even the most dense scientific problems. The story begins with various dignitaries literally vanishing at Midland University. The college president hates Hank, in part because Hank jilted his daughter Helen at the alter in the previous story, but he is forced to seek him out for help in order to solve the mystery. Hank arrives in time to witness a blurred vision of a man appear, say something unintelligible, then disappear. The farmer is able to deduce from the particulars that this man must be trying to reach him from the future. And he is correct. Lancelot Biggs appears more clearly the next time and asks for Hank Cleaver. Hank identifies himself and prepares to go to the future. But two others in the room, one of them being Hank’s former fiancé, get too close and are also swept away into the future. They find themselves aboard the Saturn, the space freighter that employs Biggs as a navigator. Biggs had experimented with a device that he invented to help increase the speed of the ship. The ship sped up alright, but then they found that the ship had entered a strange region of space where all is grey and no stars shine. Biggs, through the use of a time travel device he had created in a previous story, sought out Hank because he hoped that he could help solve the problem. Hank quickly figures out what had happened. Biggs had done too well and the ship traveled so fast that it entered negative space. Soon they spot something in the endless grey, a massive featureless globe exerting a powerful gravitational pull. The captain orders reverse engines, but the ship continues to accelerate toward the mass. All seems lost and Biggs decides to return the visitors back to their time, but the time machine is now broken. As doom closes in, Biggs finds out that Hank is not married to Helen and has no children. He gets excited and announces that there is hope. He asks Hank to try whatever he thinks is best, turning over control of the ship to the farmer. Hank orders full speed ahead directly at the object. This works and the ship pops back into normal space. Afterward, people wonder why Biggs got so excited, but Hank figures the answer is obvious. Because the past can’t be changed, Hank could not die at that time because Biggs knew that Hank would marry Helen and have children. And many generations later, one of his decedents would be Lancelot Biggs. The story is reasonably entertaining and has its moments, but it is not one of Bond’s best. We will encounter better Lancelot Biggs stories when I review short stories in January. “The Visible Invisible Man” by William P. McGivern – Originally published in Amazing Stories, December 1940. Oscar Doolittle goes to the drugstore to purchase 50 pounds of vanishing cream, planning to use it to concoct a new cosmetic product. The clerk thinks he is nuts, but takes his money. When Oscar gets back to his apartment, he combines the cream with his secret ingredient and the whole thing blows up in his face. His landlady is furious and evicts him. He reports to work at the bank and tells his fiancé that maybe people are correct in thinking that he is a failure. She agrees and gives him back his ring, then goes off with Lester, the efficiency expert at the bank who always gives him a hard time. Soon after, Oscar hears a buzzing sound in his ear and realizes that he has turned invisible, clothes and all. He panics, runs around bumping into people and is stuck in corner when his ex has a conversation about him with a girlfriend. The buzzing sound returns and suddenly Oscar is visible again. His ex concludes that he is a snoop and storms off. Later while he laments his life, Lester shows up with the bank president and two police officers. Oscar is accused of stealing a $25,000 bond from the bank vault. Lester says arrest him, but the bank president wants to give Oscar a chance to defend himself. Unfortunately the buzz sound returns and he vanishes, giving the impression that he is guilty. Oscar uses his invisibility to spy on Lester, whom he finds out is responsible for the theft and is planning to give the bond to his accomplice, a woman, at the company dance tonight. The on and off vanishing act continues at the most inconvenient times as he tries to clear his name. Naturally, when he is trying to retrieve the bond from the woman’s purse while in the ladies’ bathroom, he reappears with his ex as a witness to his debauchery. Desperate to salvage his doomed life, Oscar becomes brave and beats up Lester to make him confess. Additional proof of his innocence, in the form of the recovered bank bond, is delivered by his ex who has had a change of heart and now wants to marry him. This is my least favorite of the novelettes reviewed here. The story telling and humor are middling, and I had real trouble suspending disbelief due to his clothes joining in on his vanishing act. I have narrowed my novelette nomination list down to nine stories. One that makes my list for sure is the “The Hardwood Pile.” It is not quite as well known as the other de Camp story I reviewed here, but it is probably going to capture the number one spot on my ballot. Maybe you will disagree, but read it and give it a chance to win you over. Of the other five novelettes reviewed here, I think two of them (“Butyl and the Breather” and “The Exhalted”) are worthy of consideration. Non-humor stories worth considering include; “It,” “The Roads Must Roll,” “Blowups Happen,” “The Voyage That Lasted 600 Years,” “Farewell to the Master” and “Vault of the Beast.” Trimming the list down to five is not going to be easy. I am sure others will have favorites that I haven’t mentioned, and I would be happy to hear what those stories are, particularly if I haven’t read them yet. 2 thoughts on "Scide Splitters: 1941 Retro Hugo Eligible Novelettes"
Additional contact information can be found under the INFO menu tab at the top of the page. Amazing Stories is a responsive web site, capable of reformatting for display on desktop computers, tablets and modern phones. The website is maintained by the Experimenter Publishing Company. Amazing Stories is a Registered Trademark of Steve Davidson and the Experimenter Publishing Company. Copyright © 2019 Experimenter Publishing Company All rights reserved.